How do I get there? First, I tear down the walls, literally. There is no need to have separate classrooms, with doors on them, in an area that is designed to be open and collaborative (the thesaurus was not helpful when looking for a synonym, since the last post was heavy with that word). So, tear down the walls that are breaking off the class rooms, but leave up the walls to a new work room. Next to the teacher workroom is their technology supplies, projectors, replacement bulbs, videos, professional development books, and anything else a teacher might have need of, all in one place! The other side will have a similarly closed room (with a wall of windows, though), that is storage for the library. Books, periodicals, class sets of books (thinking ahead to core curriculum standards), and anything the librarian might need to process these things (maybe a book repair station, book trucks, etc. 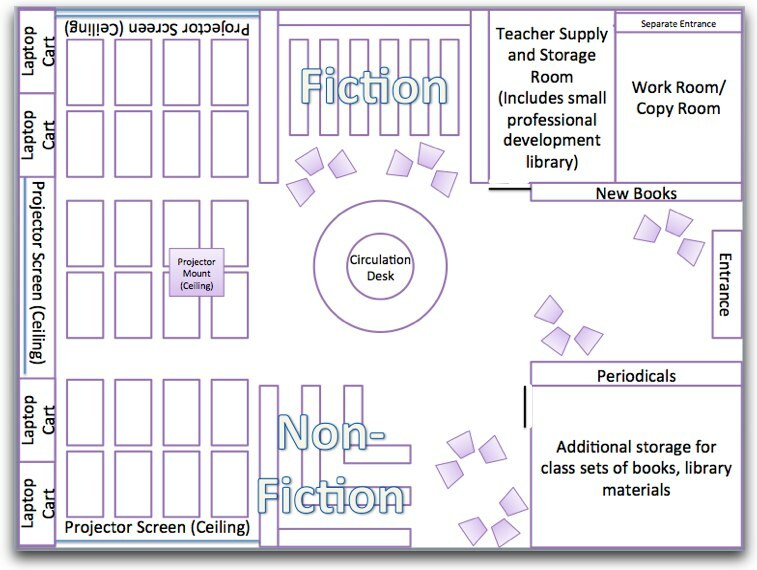 This room is also smaller than the work room on the other side, and has seating just outside the door, as well as the non-fiction/reference section of the library. Note how this non-fiction area is smaller the fiction section on the other side of the room. In between them is the circulation desk, which is conveniently located directly in the center of the room so that the librarian can see everything all at once. The bookshelves are all lower, my school is middle school/intermediate school, so about 4 feet high (so you can see the kids). Corner bookshelves don't leave space for students to cause trouble in. Bookshelves against the wall go up all the way, leaving a small amount of space for displays. The back of the room is devoted to work areas. Tables with comfortable chairs, laptop carts (at least 3), projectors installed in the ceiling, movable partitions if teachers need more privacy. I'm thinking skylights above the circulation desk to the main entrance (with screens on them, to block out UV and brightness), ceiling not too high, skylights are pitched. The wall along the back, by the work areas, is the bottom half shelving for technology storage, and room for the laptop carts, and the top half windows with wooden shutters. These let in light when needed, but can be closed easily if necessary. They also don't get tangled up like blinds do. There could also be an entrance located in the back, if it is plausible to do so in the library. This would be an outside entrance. Scattered throughout the library are small seating areas for student lounging. A link to my ideas for furnishing (I gave into the Pinterest, if you wonder what I'm wasting my time on this weekend) and a picture of my library. If I were thinking ahead (which I try to do) I would have posted these three posts days apart, unfortunately I didn't. Boo. I like your rolling tables on pinterest! It's also a good thing that you have a clear view of the library while sitting at the circ desk. Do you think you would need all those areas for instruction? Especially if 2 classes did come in at once and they couldn't share because there are no walls? Just curious. Also, you get to design your own library soon!! Well, the middle area is more study area than instructional, I also think I would put up mesh rolling screens that can be moved out, if needed. The idea was that the space could be open for large gatherings, but could be closed off if needed. Good idea--flexibility is important! And I like that you have a big open area right when you walk in, but then there's plenty of potential for smaller, quieter spaces, too. Wow! Your Pinterest collage has a lot of great ideas! I especially like the bean bags.